Our goal is to raise funds to record a new album in Hawaii, submit it and compete for a Grammy Nomination by The Hawaii Academy of Recording Arts. The band will be comprised of native residents of the Hawaiian Islands and myself, Deems Tsutakawa on keyboards. 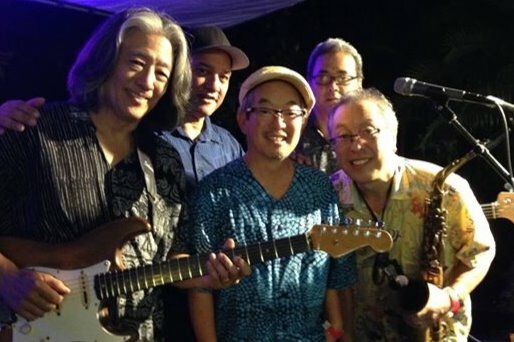 The group consists of: David Yamasaki guitar, Steve Bader drums, Owen Matsui bass, Fred Li sax, & Keahi Conjugacion vocals. We were nominated in 2018 for Jazz Album of the Year and I was honored to perform at the awards this past May with Keahi. The target date for the recording project is the Spring of 2019. Each donation of $30 or more will receive a free CD of the new music. For each donation of $1,000 or more Deems will reciprocate with a live performance at the donor's choice, certain restrictions apply, and the logistics must be mutually agreed upon. We had a very successful weekend of rehearsals in Honolulu this past few days and have 20 new songs ready to record. The plan is to pare it down to 15 and keep the 10 best for the new release. It will be a mix of originals and covers-we are all fired up for sure. Once again-Thank you for your generosity and love. We are on track to meet our goal as although the GoFundMe PG says we are at a low number I rec' a substantial donation from a private source that went directly to the J-Town Records account. This puts us in position to get going on the new album project. We are all pumped up and have a lot of new material to record. FYI-we are off to a good start with the Hawaii CD project and are at about 10% of the projected goal. Once again-A BIG THANK YOU for your support!